Armed with his bamboo telescope and magic carpet, Raja Bomoh may be able to accomplish what politicians cannot. 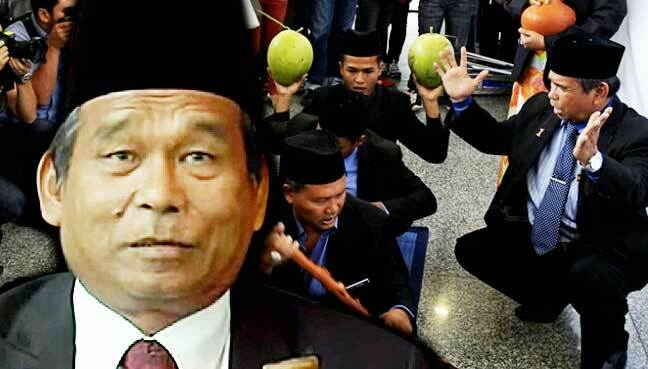 Ibrahim Mat Zin, popularly known as Raja Bomoh, is said to be considering a political foray in Bagan Datuk. When media reports said Ibrahim Mat Zin, better known as Raja Bomoh, intends to enter the political race in Bagan Datuk, many people probably breathed a sigh of relief. As Malaysiaâs internationally renowned shaman once told reporters, he has been instrumental in protecting the country from harm for the past 70 years. The Americans have Captain America and other superheroes like Superman, Batman, Iron Man and Wonder Woman. But Malaysians are a practical bunch and extremely cost-conscious. Our prime minister doubles as the finance minister. We also have ministers whom we know hold down two jobs. By night, one is a nasi goreng seller. Another who lives close to his office potters around in his vegetable garden and gives the produce to his community. Our ministers have two jobs or more because they are not as extravagantly paid as those in other countries. So Raja Bomoh would be good for Malaysia. He could also act as the defence minister, which would save us a fortune in Exocet missiles, submarines, and expensive weaponry. As Raja Bomoh can peer into the next realm with his bamboo telescope, our Armed Forces would be able to dispense with the fancy radar technology which keeps breaking down anyway. Locals who live on the eastern seaboard of Sabah complain of incursions by Suluk warriors and pirates who reportedly walk unchallenged into towns and villages. Perhaps Raja Bomoh will be able to provide them with better security than the billions of ringgit poured into the Eastern Sabah Security Command. Letâs talk transp ort now: the closest the Americans have to Raja Bomohâs magic carpet is the Stealth bomber, but even that cannot travel through parallel dimensions. No radar would be able to detect Raja Bomohâs flying carpet, and petrol price fluctuations would have no impact on it. But perhaps Raja Bomoh would be able to bring the people of Bagan Datuk what they really want. Mariam Mokhtar is an FMT columnist.